Enter the S3 IP, or use the default address as the current server's IP address. Enter the RabbitMQ Host IP. Again, you can use the default to install it to the local server. RabbitMQ will be installed. Enter the Cloud Controller Host IP address. Enter the mySQL Host IP address. You will choose an admin for the project, and also name the project here. Also, you will build out the network configuration for the project. At this point, you've entered all the information needed to finish deployment of your controller! Feel free to get some coffee, you have earned it! #service libvirt-bin restart ; service nova-api restart ; service nova-objectstore restart ; service nova-network restart ; service nova-scheduler restart ; service nova-compute restart. Unable to run euca-describe-images. Is euca2ools environment set up? 2.nova-objectstore 與compute node 在同一台機器上不會有這個問題，除非是增加的compute node. 3.除了compute node 之外，其它component 都是可以跑在VM內，我沒這樣做過，但是我很肯定可以。 由於KVM 需要機器本身支援VT功能，所以把Compute Node 設在VM內應該是不能開，除非更換其它Hypervisor. UML 好像可以 but not a good idea actually. 1.一張網卡也可以不過要手動解決一點問題，如果兩張網卡可以省下很多工夫，不論 Flat or FlatDHCP 都需要br100 當橋接介面。 好像很快也可以選用OpenVSwitch. I just test with bzr branch and got same issue. You can pull code from the link , I believe that will work for you. But, the package install step not match openstack compute administration manual. The local_settings.py file also differ. nova的網路環境溝通 我兩張網卡一個用dhcp連至外部switch 一個接內部完全只是PC對PC的HUB的staticIP設定 在設定sudo nova-manage network create 居然出現error IP範圍過大 可否說明一下我的作法是否錯誤? 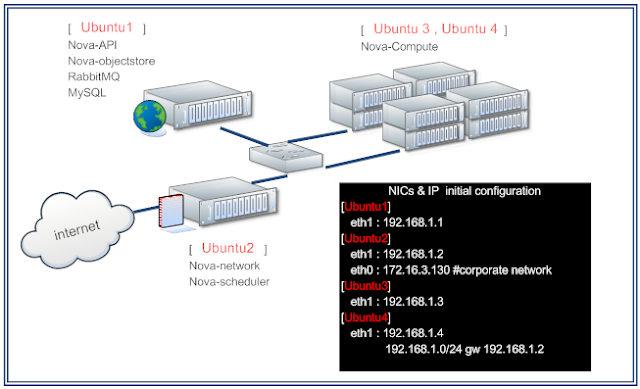 3.nova.conf的-fixed_range= 與 sudo nova-manage network create 有甚麼關聯 可以設一樣嗎? Object storage也分為storage node, proxy node, auth node. plz check console output for more information. sudo mysql -uroot -pnova -e "GRANT ALL PRIVILEGES ON *. * TO 'root'@'%' WITH GRANT OPTION;"
sudo mysql -uroot -pnova -e "SET PASSWORD FOR 'root'@'%' = PASSWORD('nova');"
network manager flag should be added in nova.conf...due to the default value is VlanManager. 應該是 cactus 我用apt-get install 安裝會分版本嗎? 每種type 可以設定不同的vcore /ram / diskspace etc. Hugo 沒關係 我在想想辦法吧 我們台北有分公司 不過我沒去過 認識不多 假日是否提供場地 也許我要在問一下 有甚麼消息 我在跟你說吧! 5.OpenStack Compute - Cactus Release 是一個tar.gz 但Administration Guide安裝方式卻不用這個檔安裝 這個釋出的檔有何用途? 請check console output, 大概是沒get 到metadata , If so , plz check the traffic between nova-api & instances. Actually , I need console output of instance. What's the version of your NOVA ? 2011-07-18 17:04:21,696 INFO nova.compute.manager [-] Found instance 'instance-00000006' in DB but no VM. State=8, so setting state to shutoff. 2011-07-18 17:05:21,757 INFO nova.compute.manager [-] Found instance 'instance-00000006' in DB but no VM. State=5, so setting state to shutoff. 2011-07-18 17:06:21,789 INFO nova.compute.manager [-] Found instance 'instance-00000006' in DB but no VM. State=5, so setting state to shutoff. 2011-07-18 17:07:21,816 INFO nova.compute.manager [-] Found instance 'instance-00000006' in DB but no VM. State=5, so setting state to shutoff. 2011-07-18 17:08:21,844 INFO nova.compute.manager [-] Found instance 'instance-00000006' in DB but no VM. State=5, so setting state to shutoff. 2011-07-18 17:09:21,867 INFO nova.compute.manager [-] Found instance 'instance-00000006' in DB but no VM. State=5, so setting state to shutoff. 2011-07-18 17:10:21,895 INFO nova.compute.manager [-] Found instance 'instance-00000006' in DB but no VM. State=5, so setting state to shutoff. 2011-07-18 17:11:21,917 INFO nova.compute.manager [-] Found instance 'instance-00000006' in DB but no VM. State=5, so setting state to shutoff. 2011-07-18 17:31:35,008 ERROR nova.compute.manager [AUCG29G6M3XFHSLUJ0F9 mydlink mydlink] Instance '9' failed to spawn. Is virtualization enabled in the BIOS? 2011-07-18 18:04:06,310 ERROR nova.compute.manager [5Y0U3W12UJ46KQTA9JZL mydlink mydlink] Instance '12' failed to spawn. Is virtualzation enabled in the BIOS? 2011-07-18 18:04:07,062 INFO nova.compute.manager [-] Found instance 'instance-0000000c' in DB but no VM. State=5, so setting stateto shutoff. 2011-07-18 18:05:07,088 INFO nova.compute.manager [-] Found instance 'instance-0000000c' in DB but no VM. State=5, so setting state to shutoff. 1.The answer is Yes . 1.在網路設定的部分，有看到public ip 與 private ip兩部分，想請教該差別為何? buntu12.04 + esse , 有遇到EC2_ACCESS_KEY的問題, 進入web 後的 set 頁面, 有個Download EC2 Credentials, 抓下來後有兩行資料copy到 novarc , source novarc 後可解.